The peak I wanted the most in the Mont Blanc area was the Grandes Jorasses, but I decided to put it off, both because it looked like I had two days of good weather, and because I am honestly a bit intimidated. Instead, I found a couple of other nearby “big” things with less difficulty and higher trailheads, which I could reasonably do back-to-back. 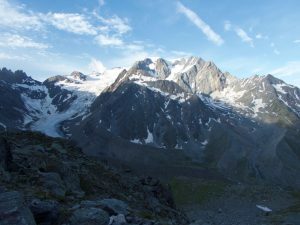 The first was the Grand Combin, a peak in western Switzerland with a high trailhead near Bourg-Saint-Jean at 1850 meters. It has both a rock route, the west ridge, and a glacier route, the northwest face; I went up the former and down the latter. The trailhead for this peak is a parking space for a half-dozen cars, with locked spaces for another six, next to some guy’s farmhouse. Driving around from Chamonix, I got there in the evening and pulled into a not-at-all-level spot. Not only was the spot slanted, but the flies and manure stench from the nearby cows were a bit intense, so I eventually was forced to find another, flatter spot on a side-road farther from the cows. It is hard to get away from cows in this valley, though, since they roam within electrified fencing to over 2000 meters. Since I was doing a west-facing rock route with only about 2400 meters of gain, I got a non-headlamp start up the manure-strewn trail, taking a slight detour around some cows resting directly on it. The frequent red-and-white paint marks on the rocks directing me toward the hostel were helpful in the pasture, but less useful above, where a well-defined trail climbs up the valley to the left of some old moraines. I passed some climbers descending from the hut on the final, steep climb, which ended at a nice stone hut with what I assume was the flag for the appropriate Swiss canton flying next to it. No one seemed to be home, so I continued up a cairned trail to the base of the snowfields leading toward the ridge. It was still cold on the shady side of the mountain, and the snow was rock-hard, so after trying to sketch up it a bit in running shoes, I put on crampons and followed the boot-pack up a surprisingly long and steep snow slope to the minor col. The west ridge rises about 800 meters from the col to the summit in not very ridge-like fashion. 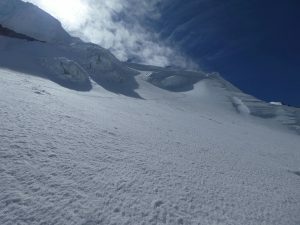 While there are a few class 4-5 steps, most of the climb is a wander up chossy slopes and gullies, either staying on the ill-defined crest or avoiding difficulties to the right. 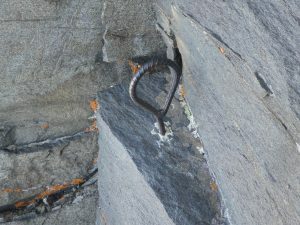 Though I surprisingly had the peak to myself, the route is apparently popular, since I found numerous bolts and rebar loops for protection on the steeper parts. I finally reached the sun just below the western sub-summit, which was decorated by a mopey-looking Virgin Mary and a memorial plaque for Sebastien and Nicolas, two men who apparently died young in separate incidents. 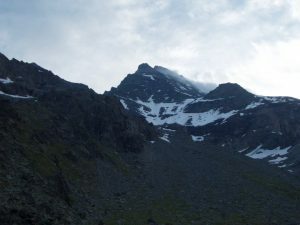 From there, a boot-pack in the snow/glacier continued down to a saddle, then up to the true summit, where it joined the main track coming up the glacier. Though it was sunny, it was windy and cold, and there were scattered clouds mostly hiding the high peaks to east and west. 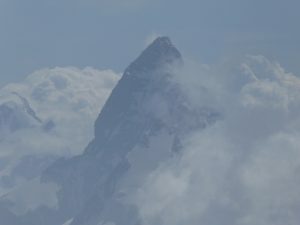 I did, however, make out what I am pretty sure is the Matterhorn. It was too cold to hang around, so after taking a few pictures, I headed down the main glacier track, figuring that even with the climb back over the west ridge, the snow descent would get me down faster. Unfortunately, this turned out not to be the case. It was too cold for the snow up high to have softened, so I had to walk down in crampons instead of sliding. Also, the route got steeper and more complicated where the glacier drops off a sort of summit plateau. The boot-pack helped in threading steeply between some crevasses and seracs, then grew faint and split below. I followed one track for awhile, then left it when it seemed to be heading straight for a steep ice bulge. Serac-fall and/or avalanches had scoured off the surface snow in many places, leaving glacial ice with just a bit of firn on top. The slope angle was about 45 degrees, a bit too steep for comfort on ice in my running-shoe crampons. With a bit of careful side-climbing, and a few deliberate swings and sticks of my ice tool, I managed to reach another boot-pack in a region with a bit more surface snow. From there, careful and often inward-facing downclimbing got me to the glacial plain at the base of the face, where the snow was softer and I was finally able to move at a decent pace. The climb back to the col in the west ridge was less painful than I had feared. Unfortunately, the other side was also mostly slow going, as it was too steep to glissade, with a bad runout. I finally got to move quickly for a bit across the low-angle snow, heading for a large cairn and some flags pointing to the hut path. I stopped at the edge of the snow to switch to shorts, wring out my socks, and put away my snow gear for the day, then started hiking and jogging toward the hut. There were a half-dozen people hanging around outside, including a woman who proved to be the hut guardian. I almost went by without saying anything, unsure of the proper etiquette, but after exchanging greetings, this guardian proved much more outgoing than the last. Fortunately, this corner of Switzerland seems to speak French, so I could actually carry on a conversation. She and the guests seemed surprised that I had done the Grand Combin, more so that I had made it down the glacier in running shoes. I explained as best I could that it hadn’t been particularly easy, but that you could do a surprising amount of snow work with running-shoe crampons and experience in how to use them. After talking for a few minutes, I left her to prepare for the crowd arriving that afternoon, and began jogging and hiking toward home. I passed multitudes on the way down and, due to them, ended up taking a different trail. 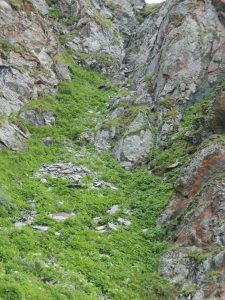 Though the route I had taken on the way up was well-marked and easy, there is another path that forces its way up a gully via two ladders and some chains — the Europeans really like their ladders, it seems. 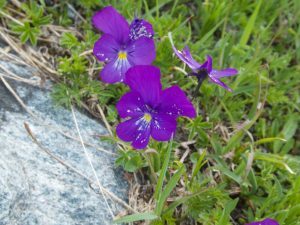 Wearing shorts, I was reminded on the way down that the Alps have stinging nettles, so my thigh hurt for a half-hour, and remained swollen for the rest of the afternoon as I drove through road construction and an overpriced tunnel to Aosta, then on to the next trailhead at Pont.